Every year, the BFA selects the male and female National Champion based on competition results across all disciplines in the pool and open water. For UK divers this means training year-round and often having to travel abroad to reach the depths needed to excel on the world stage. The 2016 champions are Tim Money and Liv Phillip. Both athletes are cornerstones of British freediving; they are not only consistent high performing athletes on the pool circuit, but they rank at a high level in depth disciplines as well. The BFA would like to congratulate them both and wish them every success in 2017. Meet 2015’s UK Champions Liv Phillip and Tim Money, who have trained together for many years in London. This is Liv’s 9th consecutive year as Champion, and Tim’s 3rd. Both are AIDA Instructors, representing the UK regularly at team and individual championships and both volunteer their precious time to assist in running the BFA. 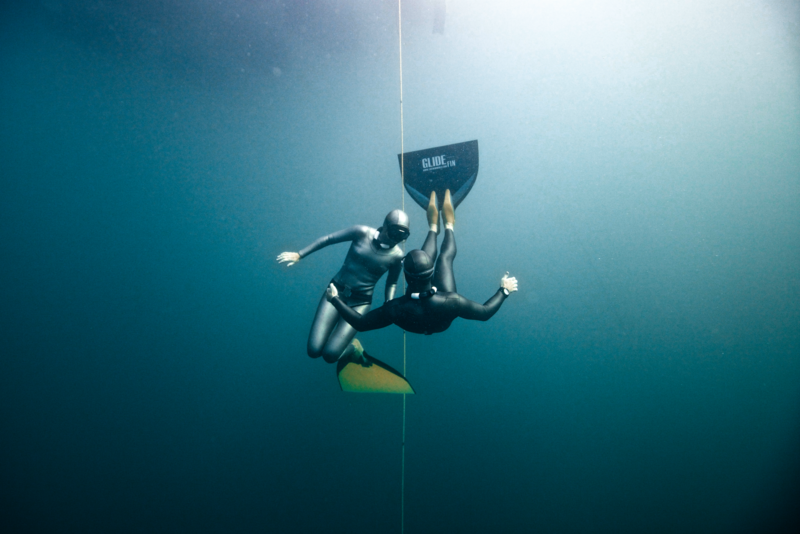 Liv and Tim spoke to each other about their freediving year, challenges overcome, achievements and how they’ve kept on top of their game for 10 years. Tim Money (TM): “Freediving is great escapism from conventional life, which of course I value with my job and family, but it gives me a chance to have some adventures. Plus, the community is special. At events there is a common shared love and understanding of freediving despite differences in race, culture and lifestyle and I think that is pretty unique. Our sport is competitive, but because of the intensity of our sport, camaraderie shines through”. LP: “2015 was totally about looking after my family and not about freediving. I took two trips to deep dive this year and the training time was minimal, but it provided some much needed time away from responsibilities back in the UK. Family illness and difficult circumstances meant it wasn’t possible to make the sort of selfish decisions necessary to be a top athlete, but made it very clear how much I love diving in the sea. The challenges I’ve faced this year outside of freediving have been very important to me to put into the perspective how unimportant competition results are in the grand scheme of things. Having said that, as soon as I was in the water, I valued every moment and I think that explains winning the British Champion title. I ended up with a personal best in Free Immersion with a 4th place dive of 68m at the Depth World Championship in Cyprus. The nice thing is that my mum is my biggest fan and this really cheered her up”. TM: “I got some more time in deep water this year which let me concentrate on some things. I did more UK diving, which I enjoy and keeps me from getting so rusty, and I was able to get away to the Cyprus Depth World Individual Championships. I did a Constant Weight dive to 67m there, but I think for me the real achievement was the experience of learning how to do that. I went to the Bahamas earlier in the year for the Vertical Blue Championship and my family came along, but I found my little girl won my attention hands down and so I just dived for fun”. TM: “I question this every winter, and I’ve decided I will continue in whatever way as long as I am enjoying it. That may be recreational, within my club, teaching, or competitively”. Liv would like to thank Fusion Lifestyle, Powerfins & Elios Wetsuits for their support in 2015. Tim would like to thank Powerfins and his employer Saba for their support in 2015. Liv Philip & Tim Money Crowned Again! Saturday 25th January 2014 — Tim Money and Liv Philip (www.free-flowh2o.com) have been awarded the annual UK National Freediving Championship prize once again! Both athletes won last year, and incredibly this will be the 7th time in a row for Liv. Tim and Liv of London Freediving (www.londonfreediving.org), are experienced athletes who put a lot of thought and work into their training and both reaped the rewards in different ways: Tim sites this as the year his deep diving changed, taking on the same consistency of the pool, learning a different way to equalize and progressing 10m deeper than his personal best; Liv’s concentration on performance was divided at the beginning of the year with teaching in danger of taking over, but with time invested on herself to train she earned a bronze medal at the World Championships. The year kick started for both athletes, in the wet and cold winter with some pool competitions whilst training off-season, achieving some solid performances at the Riga Freediving Cup (www.free-diving.lv/competitions.html) and the Great Northern International Pool Championships (www.freedivingcompetition.com). As the summer began the great friends who have trained together for many years, travelled to Myrtos, Greece, to take part in the 6th Mediterranean World Cup (www.freediving-club.gr). This event was particularly significant for Tim, as it was here that his diving technique changed completely: ‘I figured out I had been equalizing a very hard way for the last six years, and there was an easy way to do it! It was a revelation, I went from constant focus, and probably anxiety of whether I can equalise at the next meter, to just falling and ears open no stress, laaaaa…. amazing.’ Performance-wise Money did well, diving five times below the 60m mark over the course of the competition. Selection of the annual male and female UK Champions is made by collating points earned across all six competitive disciplines, pool and depth, between 31st October and 31st November.